Step by Step guide to bypass Mi account FRP on Xiaomi Redmi Y2. if you own Xiaomi Redmi Y2 having FRP issue [This device is associated with an existing mi account type password to continue] then you can bypass it using the bellow Guide. here we Share a tool Which have ability to bypass MI account on any Xiaomi Devices. You can use it using the below Guide. 4. Ensure that your Device at-least 50% charge During Process. to Stop the Accidentally Switch off. 1. Download and Run s droid toolkit.exe File from extracted folder. 2. Now Install QD Loader Driver on your PC. 3. then reboot your Phone to bootloader and Connect to PC. 4. Then On S droid toolkit type 19 and hit enter it will boot your Phone to edl Mode.Go back. 5. then type 27 and hit enter it show you 3 option Select Xiaomi type ‘g’ and hit enter. 6. a new popup is now opened select MI account Remover according your Window version and Click Start. Go Here Click Forgot under Login Details. Insert your Registered SIM on another phone. wait until You Receive Forgot Link. When Receive Click on Link open it in Browser type New Password Click Change and then Go back to locked Phone and login with new password. Final Solution to bootup Your Phone. This Method Require twrp Recovery or a unlocked bootloader. 1. First of all Download a Custom ROM For your Phone, We have Share Many Custom ROM For all Xiaomi Phone You can take any one From Here. 2. then Reboot phone to twrp using volume and power keys. 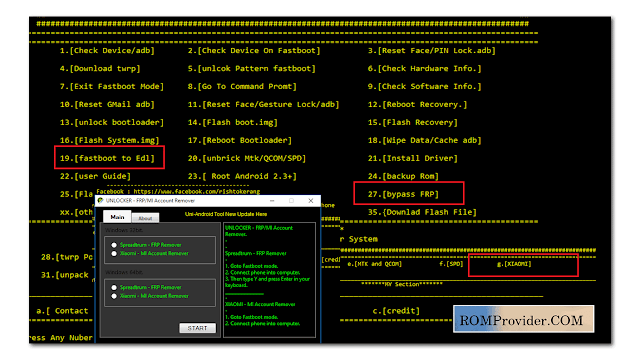 3. on twrp enable MTP or if enabled then transfer ROM file from PC to Phone. 4. Go to backup tab and create a nandroid backup. then flash Downloaded ROM using the Install tab. 5. Reboot system Now. Done. 1. Reboot Phone to twrp. create a backup from backup tab. 2. Now go to mount tab and check system. Go back. 3. Go to File Manager Navigate System/Private app Find and delete these files ‘Mi account.apk’ Security.apk’ Mi cloud.apk’ or any other app which is related to MI account. [Don’t delete Core app [Like setting, system ui, framework etc.] otherwise Get bootlooped. 4. Go back Reboot System Now. Note: Do at own Risk You Must know How to unbrick before trying it..
Download and Extract adb tools. Method 6:Note: For MIUI 9 We need MIUI 9 Settings.apk File, For MIUI 10 We need MIUI 10 settings.apk File oterwise it will cause force stop.. TAP OEM UNLOCKING AND USB DEBUGGING.